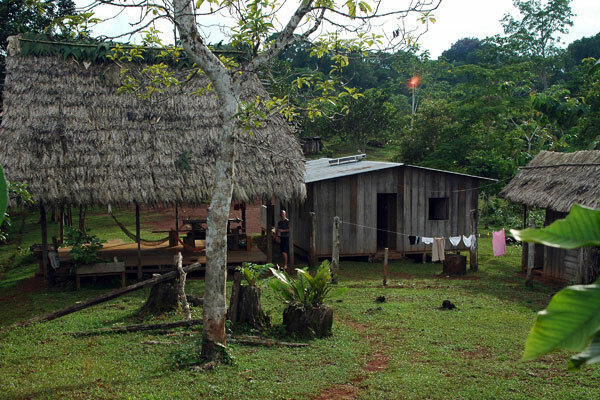 The tourists’ accomodation consists of three buildings: the main house with three bedrooms and a living room, the rancho (an open air terrace with a palm leaf roof) and a little hut containing a water closet and a shower. 6 people can be accomodated in this lodge; therefore, a cozy and familiar atmosphere is guaranteed. All beds are equiped with nets against the moscitos. Under the palm roof of the rancho you will find some hammocks to relax. The sanitary facilities are right next to the House. The toilette and the shower are locatet in a little house with a palm roof. There is also a washing station. There are 6 bedrooms in the new hostel available for groups. Early registration required.